I have come late to this, but can confirm I have assisted a couple of times in removal and refitting of a SWB E type engine/box with the reaction plate fitted and TB connected. It was necessary to bend the flanges on the front bulkhead. It is not tosh, so Please no insults as I have done this and next time (not on my car) I will take pictures and post them, although my word should be good enough. Your word is good enough for me Pat, thanks. The flange you refer to is presumably the horizontal projecting seam across the top of the tunnel under the engine stabilizer bracket? Does it strike the cam covers and prevent sufficient lift over the reaction plate? I have to say a bent flange is a high price for merely avoiding undoing and partly tapping out a few bolts. The TBs and front suspension are untouched in both methods and so are not an issue either way, just lifting the plate itself from bolts that are left partly in place instead of totally tapped out. Period. I think the flange is bent upwards by the top of the bell housing on exit and stays in that position until the lumps are returned to the car where they are fettled straight. It sounds far worse than the actual and its not something I would do on my cars, but each to their own. You dont have to remove the bonnet either to take the engine out the top. Just cut a hole big enough with an angle grinder, only takes a minute or two. 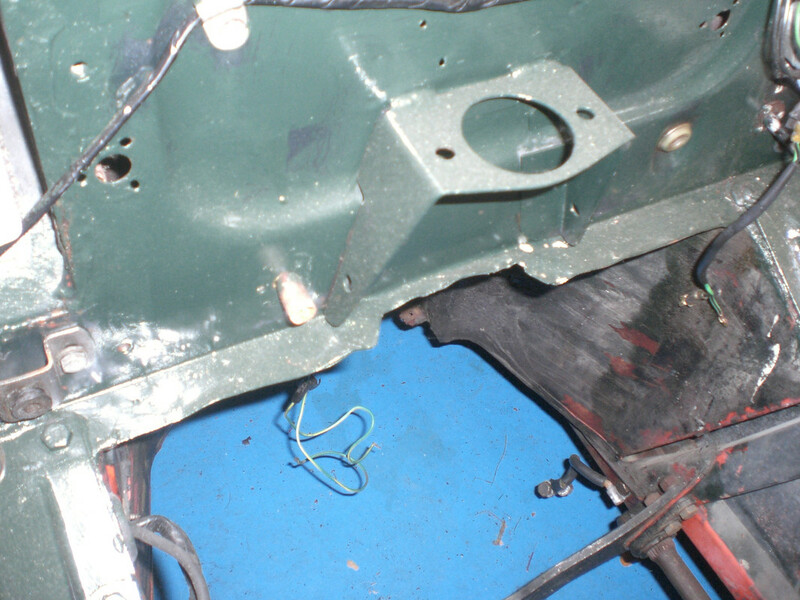 Below are pictures of a swb E Type with the engine and box removed and the Reaction Plate still in place. The engine and box were taken out a couple of weeks ago so I missed the opportunity to photo the extraction. Hopefully I will be able to catch the replacement. Note the top flange "damage". I have seen similar (and worse) post removal with the plate removed. For this method the bottom pulley and both the exhaust and inlet manifolds are removed. 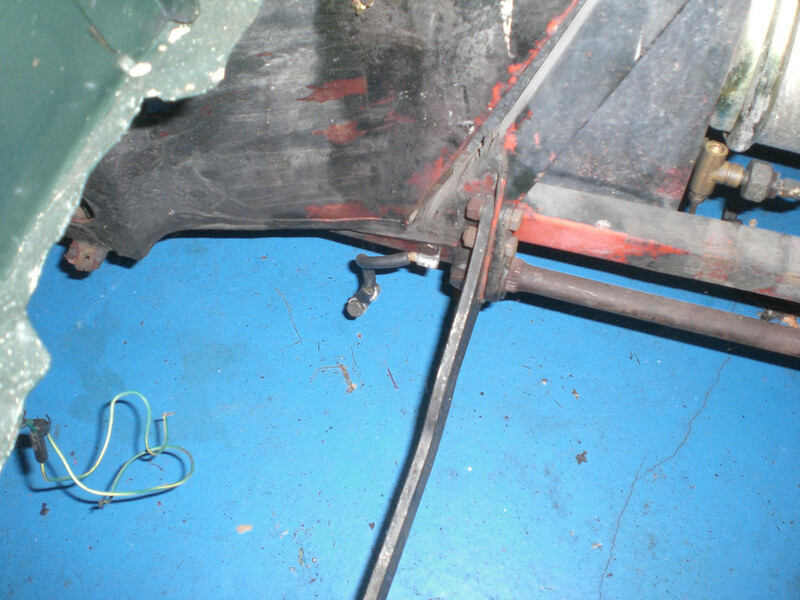 Centre console is removed along with the gearstick and the engine stabiliser complete with the two brackets. How high does the rear of the car have to be to make this work? I've been R&Ring these since 1976 however I've only done the job the (formerly) two other ways. From memory about 30 inches, however, I will confirm when it goes back in. The angle of the engine/box coming out is very steep. Wow, 30" raised at the back, and the front up some as well? The exta stuff that has to be done and removed sounds like it takes longer than loosening but not removing two torsion bar bolts per side, plus one frame rail bolt per side. And all of it can be done single-handedly, quickly and with no body damage, instead of getting some men round to help. I would like to see how the 30" off the floor rear is being supported safely whilst someone is working under the car . The steep angle of the engine and box will require more head height for lifting , probably unattainable for most . Don't do it Folks ! Thanks for sharing Pat . 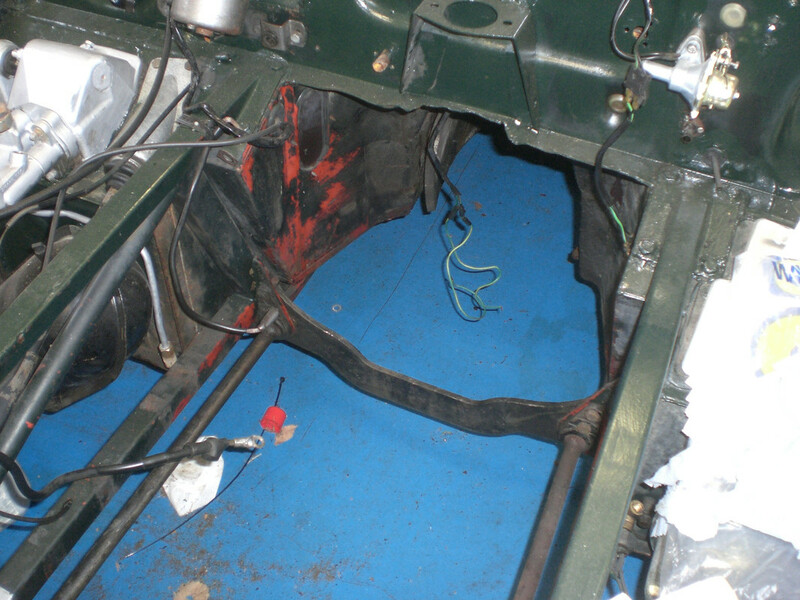 The first time I removed the engine/gearbox from an E-Type, I followed the procedure laid out in the Haynes manual. There were two things I did not like about this method. First, they have you remove the tie plate with a significant preload still on the torsion bars. I prefer to release the lower ball joints and thereby the preload, to easily remove the plate. This is also a good opportunity to have a look at the ball joints and possibly replace them with XJ-40 sealed units. When it comes time to remove the engine/gearbox, remove all ancillaries and simply lower the assembly onto the floor beneath the car. Separate the two units, remove the clutch, and lift the engine out of the car. No extreme angles required and you won't have this 800-lb. monster hanging at a 45-degree angle, six feet off the floor. Reassembly is a reverse of what I just described, and while assembling the engine and gearbox under the car is a bit of a pain, it's far safer than doing it the other way. Can't agree more with your assessment Moe. I've been following this thread with an air of disbelief. I removed the engine and gearbox exactly the way you describe except I found that splitting the top ball joints made life a lot easier. I've since seen it done without disturbing the front suspension other than removing the reaction plate. This would allow you to move the car around if required. I had the luxury of a four post lift, however one of my friends did it with only two trolley jacks, an engine hoist, several concrete blocks and a homemade trolley! The other big advantage was not having to remove the bonnet or radiator. Important for me because I didn't really have the space to store them. Amazing, isn't it how blinkered we can be There's more than 1 way to skin a cat!! This was never a thread about what is the correct or best way to extract the engine/gearbox as the OP was bothered (only slightly maybe) about having to remove and replace his reaction plate. I advised that it can be done with the reaction plate in place as I have seen it done several times. This has now been confirmed by E600 and I can also tell you that it is unnecessary to jack up the rear of the car to do this, just have the whole car level on reasonable height axle stands. Removal/replacement takes little time (10-15 minutes after the necessary removals) and is quite easy. 2 or 3 guys to guide and a trolley jack under the tail of the box is all that is required. It is no more work than the other methods. Just another choice which can be made depending on what else is to be done to the car. I don't think I'm being blinkered at all. The fact you would have to bend body work to remove the engine means that it's a complete non starter for me. The best way I found was to drop the engine down-no need for hanging the engine and gearbox at precarious angles above your precious picture frames. I got the idea from a Youtube video posted by E-type UK Limited and would certainly use this method again if the situation arose. The OP was a bit concerned about removing the reaction plate and was just looking for some advice. Suggesting a method that effectively damages the car is not IMHO the way to go especially if his next destination is the spray shop. especially if his next destination is the spray shop. As I said, each to their own. Has anyone else noticed that the OP hasn't responded since asking the question? I wonder if they just got on with the job and ignored this bickering. Maybe their car is already in the paint shop. Nobody mentioned that you can leave the reaction plate and torsion bars out if you fit the front suspension setting links. This will allow moving the car about.